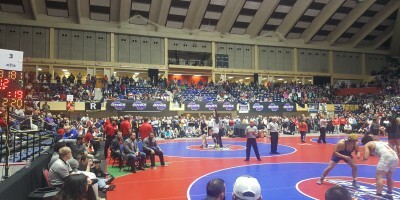 The consolation matches and finals of the 2018 GHSA Traditional Wrestling Championships took place Saturday at the Macon Centreplex, and 98 individual and seven team state championships were awarded. 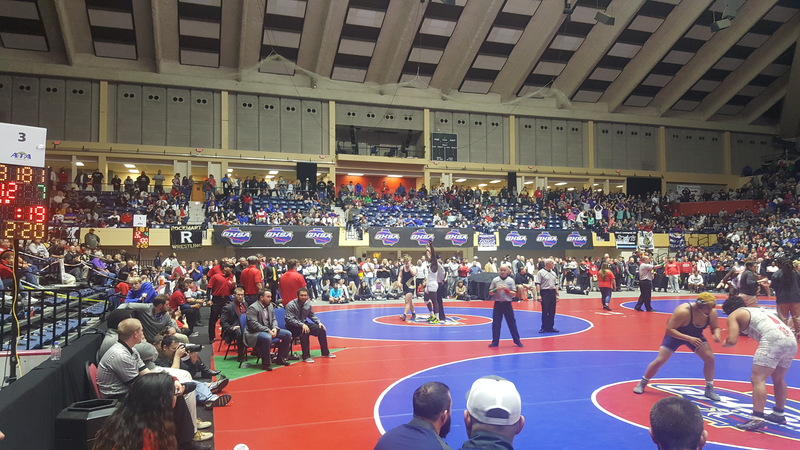 A four-time individual champion was crowned, a Statesboro wrestler made history and, as has happened every season for nearly two decades, Jefferson won. In what was a formality after Friday’s competition, Camden County successfully defended its title for the fourth year in a row by besting second-place North Forsyth in team points 233-115.5. Shortly after his victory over Milton’s Ben Williams for the 120-pound title, two-time state champion Nicholas Krug summed up the Wildcats’ consistency over the past four seasons. And what is that “extra stuff,” exactly? That work ethic helped the Wildcats to four individual state championships — repeat champions Krug, Tyler Crew (113) and Brandon Orum (126) and first-time winner Myles Starke (182). Raydan Wilder, who took the 138-pound title last year, finished runner-up to Collins Hills’ Lucas DeSilva in the 145-pound weight class. With a 153.5-point performance, Richmond Hill captured its first-ever traditional title, edging second-place South Paulding by 29.5 points. The Wildcats’ Taylor Wilson (195, runner-up), Will Evans (145, runner-up) and Caleb Anderson (106, runner-up) were the top finishers for Richmond Hill, which won its first-ever wrestling title at January’s duals championships. South Paulding’s Dustin Byers defeated Anderson in the final. Teammates Daniel Byers (126, runner-up), Austin Seymour (160, runner-up), Ruston Robinson (170, runner-up) and Raji Brown (220, state champion) led South Paulding. Buford amassed 206 points and successfully defended its title in Class AAAAA with state titles by Nick Stonecheck (132), Charlie Darracott (145) and Triston Bozoian (182). The Wolves got runner-up finishes from Nick Cambria (106), Logan Ashton (113), Kyle McCullough (126), Blaine Bergey (138) and Cooper Roberts (170). The Wolves finished ahead of second-place Union Grove (156.5), which had a wrestler, Justin Ruffin (152), successfully defend his title for the fourth year. For Ruffin, who defeated Flowery Branch’s Wyatt Sladek, the atmosphere at the state championships has been a large part of his motivation this time of the year. There was a historic moment early in the day in Class AAAAA competition as Statesboro’s Kasey Baynon became the first girl to place in the GHSA traditional championships after defeating Villa Rica’s Tripp Sauls for fifth place in the 106-pound weight class. She will continue her wrestling career at Emanuel College in Franklin Springs, Ga.
Jefferson outscored second-place West Laurens 228.5-190.0 to win its 18th-straight traditional wrestling championship. The Dragons were led by state champions Tyson Thurmond (106), Ian Statia (126), Dawson Bates (132) and Cole Potts (138), as well as runner-up Jared Blackburn (120). Third-pace Troup finished with 137.5 points. Sonoraville thwarted Bremen’s attempt at a traditionals repeat, marking the first-ever wrestling title for the Phoenix. Sonoraville edged second-place Bremen 132-120 thanks to state titles from Eli Knight (106), Tyler Hunt (132) and Trevor Burdick (138) and a runner-up finish from John Knight (195). Bremen had three state champions in its second-place effort, as Jacob Miles (195), Noah Liles (170) and Paul Robinson (285) led the Blue Devils. Social Circle relied on either a state champion or a runner-up in seven out of 14 weight classes as it won its fourth traditionals championship in a row. Tyler Post (106, runner-up), Kyle Morris (120, runner-up), Mitchell Thompson (145, state champion), John Engstrom (152, state champion), Douglas Peppers (160, state champion) and Micah Thompson (170, runner-up) led Social Circle to a 199-point performance, 63 points ahead of second-place Fitzgerald (136.0). Toombs County placed third with 101.5 points. On the way to its fifth-consecutive championship, Commerce was led by repeat champions Chase Forrester (160) and Cade Ridley (285). Forrester defeated Towns County’s Kolby Rogers, and Ridley handled Riverside Military’s Andrew Bauer to take the titles. Commerce finished with 212 team points, ahead of second-place Darlington (113.5) and third-place Trion (107).